Beauty Uses Of Tea You Probably Didn't Know About! ~ CK Jacob: Nigerian Fiction And Lifestyle Blog. Beauty Uses Of Tea You Probably Didn't Know About! I'm not much of a tea drinker. My family though, buys them like there's no tomorrow. I get them as gifts all year round so there's never any shortage of tea in my household. I know some practical uses for tea - it reduces under-eye puffiness; you could make potpourri, air freshener and soap out of them; mixed with a little salt, they make a soothing mouthwash; and you can dye fabrics and paint with tea. Aside from these though, there are other amazing uses for tea so better not throw away those tea bags just yet. After your regular shampoo, rinse with unsweetened tea. It adds shine and lustre to dry, damaged hair. Chamomile tea works wonders for blondes, rooibos for redheads, and black tea for brunettes. The cooling effect of green or black tea (either as brewed or cooled teabags) can soothe not only sunburns but other minor burns as well. Brewed tea with lemon and honey would make for a refreshing antioxidant-rich spritzer. Black tea mixed with sage and rosemary and let stand overnight makes for an inexpensive and natural hair dye. Cracked a nail? With the help of a basecoat, you can glue a small, nail-shaped piece of tea bag to cover the broken part. Brewed green tea with sugar and grated ginger can be a cheap and easy DIY exfoliator. A wet tea bag can soothe redness, irritations and razor burns. Green tea is said to be infused with antioxidants and anti-inflammatory properties so whether you drink it or use it topically, it can be an effective, natural cure for acne. Looking for an inexpensive and natural way to soften and soothe your dry, aching feet? 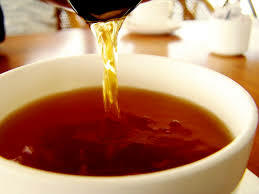 Soak away the stress and dead skin cells with a cool, strong tea. Deodorize stinky hands by washing with brewed tea. Burnt tea leaves can help keep mosquitoes away. Teas are wonderful, and this post is really informative. Thanks for sharing.